Here are some of those birds. I was driving down a road south of Laguna Atascoa NWR on a late afternoon, noting to myself how long the tails of the mockingbirds were in Texas, when it hit me. “Those are not mockingbirds!” I shouted at myself in my head, pulling over to the side of the road. 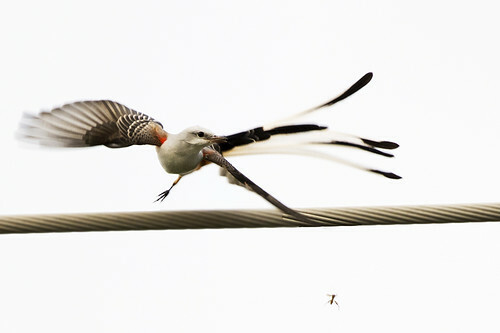 Yup, it was row upon row of Scissor-tailed Flycatchers. It’s funny what the brain will tell you when your eyes are seeing something else. It was a busy road, and I was scared that if I put one foot out of the car I would flush all the Scissor-taileds as well as the Couch’s Kingbirds and Loggerhead Shrikes that were also perched intermittently down the wires. So, I photographed the birds from my car. 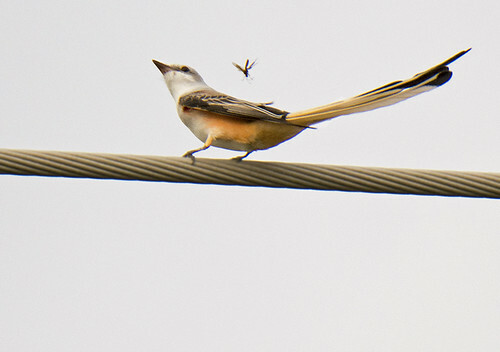 I’ve seen Scissor-tailed Flycatchers in Florida and even in New Jersey, but this was the first time that I’ve watched those tails in action. They really do look like scissors opening and closing when the bird flies, especially if it’s chasing, as this one is, a yummy dragonfly. 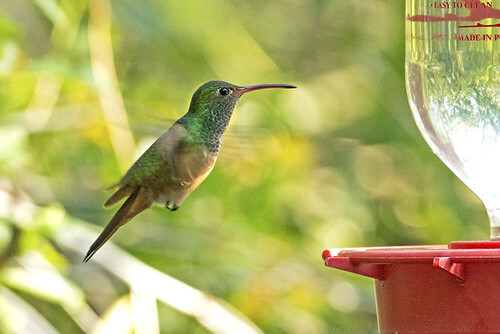 This is the “default” hummingbird in the the Rio Grande Valley, and I saw one or two every day, wherever there were feeders or flowers. I was surprised that the hummers were still there in November. Texas is the only place where they breed in the United States. 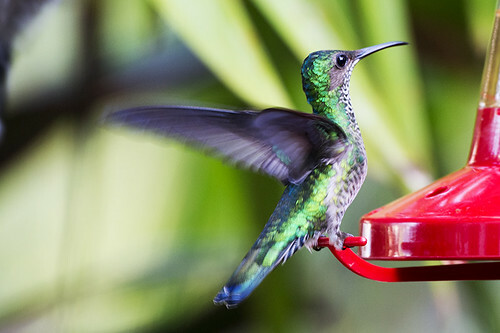 I photographed this hummer at Hugh Ramsey Park, on the outskirts of Harlingen, a very good site for Texas specialties. 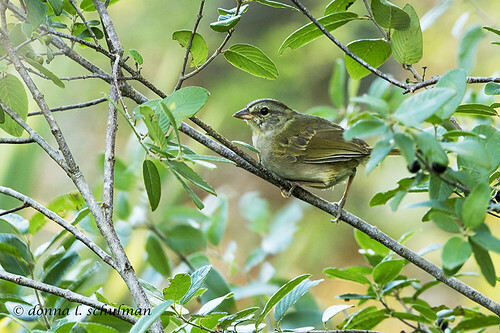 This is a rather plain looking and very sweet sparrow that is one of Texas’s “specialties,” a neotropical species that belongs in Mexico and other countries of Central America and which has also made a home in the Rio Grande Valley. 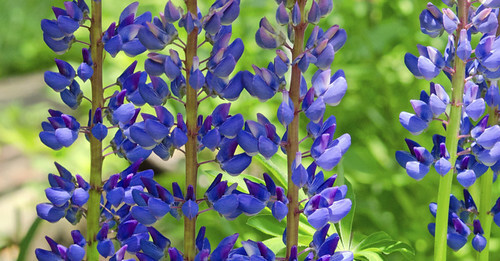 It doesn’t migrate and can be found in thickets and undergrowth. 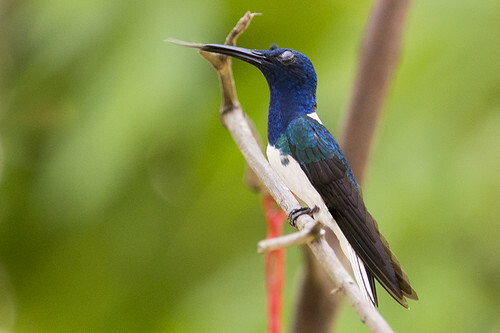 I’m not sure if this was a Life Bird or an ABA Bird for me, I need to check my Costa Rica list. I was very happy to see it on the Upper Rio Grande Field Trip led by Jeffrey Gordon (I believe it was leader Ben Lizdas who coaxed them out into the open) and the next day in Hugh Ramsey Park in Harlingen, where this photo was taken. I actually succeeded in drawing out this bird for another birder with a tiny bit of playback. And, then we realized there were two of them. And three. Maybe four! 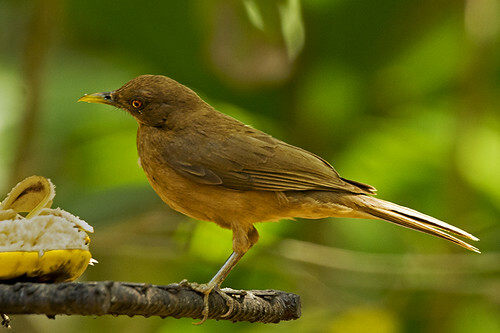 It is a common bird throughout the Valley, but not always easy to see because it loves those thickets. 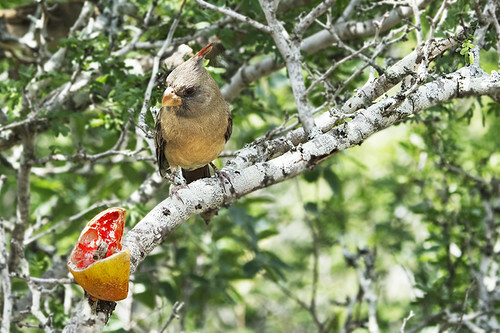 I’ve wanted to see a Pyrrhuloxia ever since my friend Marylee told me about them. Pyrrhuloxia is a bird that looks like a Northern Cardinal, but isn’t, with a name that is much harder to spell. (I ended up just calling it Pyrrs and Lox.) I saw a male and a female at the feeders at Falcon State Park; this one is the female. 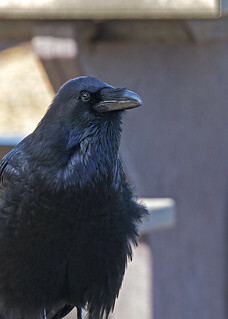 The male had a stylish red-gray coloring, but would not deign to pose. Pyrrhuloxia is another of the several Life Birds I saw on my first festival trip, the Upper Rio Grande, definitely one of the highlights of the week. At the end of every festival birding day, before partaking of the Kiskadee Kordial, birders fanned throughout Harlingen looking for parrots coming home to roost. 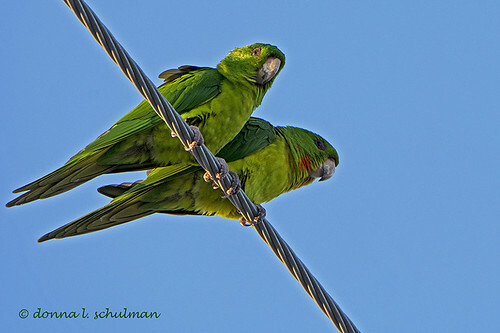 I was told to go to the Holiday Inn, in the middle of Harlingen, for Green Parakeets. 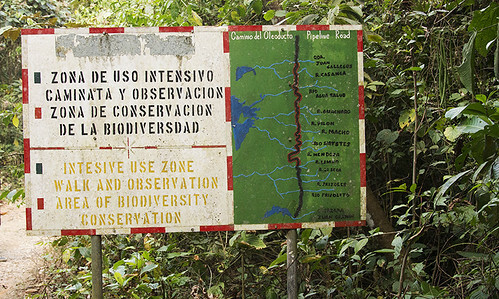 This is an established population in the Rio Grande Valley, and a parrot species considered countable by the ABA. 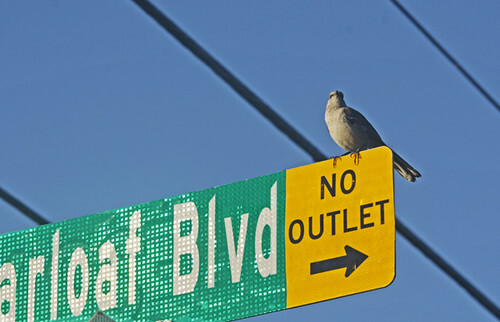 At 5pm on the dot, about 50 squawking Green Parakeets flew over the Holiday Inn and landed on wires across the road, cuddling and chuckling and licking drops of water from a leaking pipe on the roof of a wireless phone company. Fifteen minutes of fun, and then they were off again! 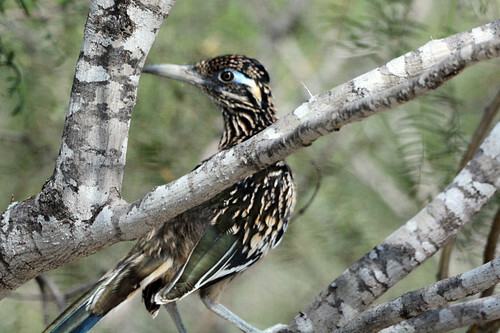 Roadrunners are the birds that cartoons are made of (beep beep! ), and us Easterners can’t get enough of them. I had a quick view of one on my SoCal trip, and saw this quirky beauty on the road, drinking in warmth on this tree. The bus driver obligingly pulled over and inched up and back as all 48 birders tried to photograph the bird through the windows. 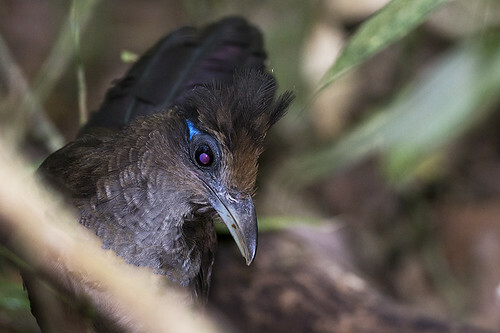 What I like about this photo is that it shows off the blue around the eye, which reminds me of Lesser Ground-Cuckoo, and the fact that Roadrunners, like Anis (see below) are members of the Cuckoo family. I was one of the few people in the group who saw the owl posed right in front of us for one minute, and gave up my most excellent photo op so I could try to get other birders on it. Of course the owl quickly flew into the owl fourth dimension, and I’ve been wondering if my fruitless altruism was stupid or the birder thing to do ever since. 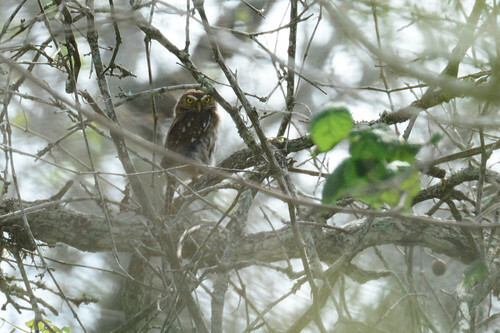 Ferruginous Pygmy-Owls are common in Central and South America, where I’ve seen them numerous times. 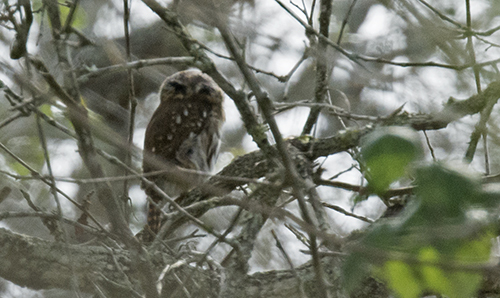 The best part of these owls is that they have large black spots on the back of their head that look like eyes. This is a very fuzzy photo, but it gives you the general idea. Yes, back of head. 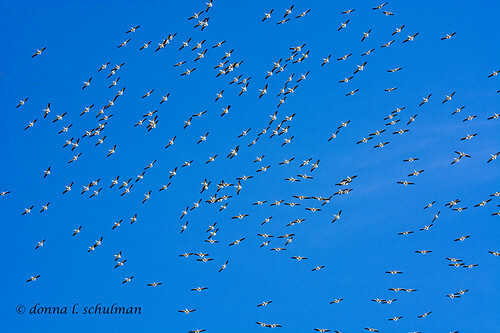 Another thrill while birding the King Ranch was looking up at one point and seeing a sky filled with White Pelicans. Anis are wonderfully primitive looking birds usually seen in Central and South America, in farm fields and pastures in small family groups. This is where I’ve seen them during my travels. (I’ve also seen Smooth-billed Anis in Florida, but they’re hard to find there these days.) Anis are good birds to know about if you do crossword puzzles. There are Smooth-billed Anis and Groove-billed Anis, and they look alike, only the Groove-billed Anis have more grooves in their huge bills. Southern Texas is the only place where you can reliably find Groove-billed Anis in the U.S., but this is usually during the summer, so people got very excited when a group of these birds was sighted at the Santa Ana NWR. 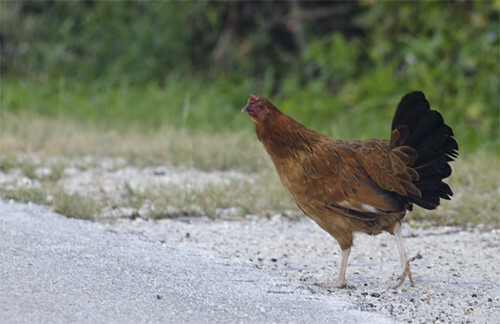 When I emerged from the ladies’ room, I was startled to see Irene gesturing to me from an area just beyond the feeders that were just beyond the Visitor’s Center. 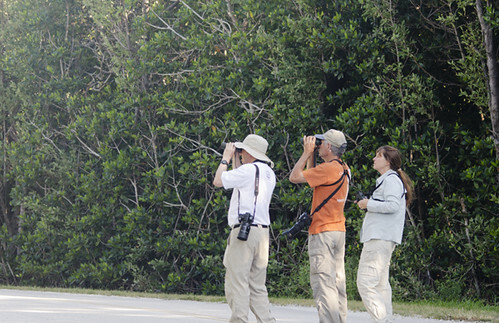 A small group of birders had their bins trained on something. I really did not think it would be the Anis. First of all, the Anis had pretty much only been seen at Willow Lake. Second, I was so discouraged from Friday’s experience, I couldn’t believe I could be so lucky to see the birds first thing in the morning. 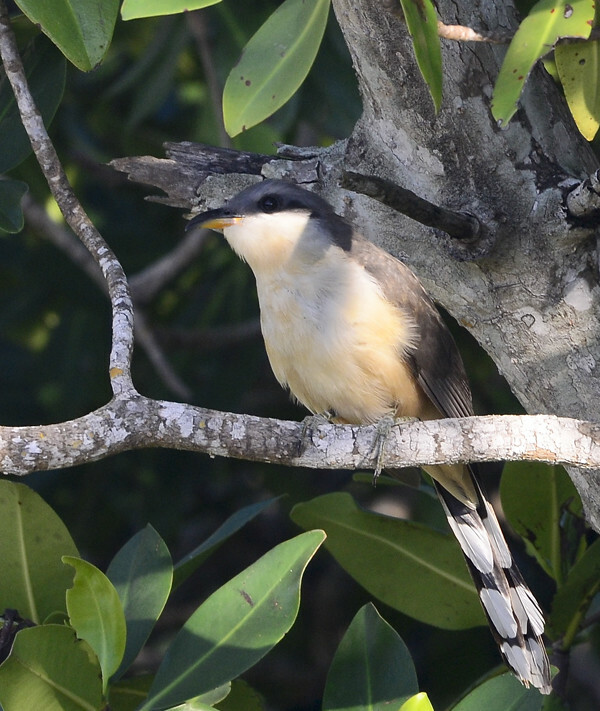 I was envisioning spending the whole day looking for the darned cuckoos (yes, Anis are members of the cuckoo family). Welcome disappointment! 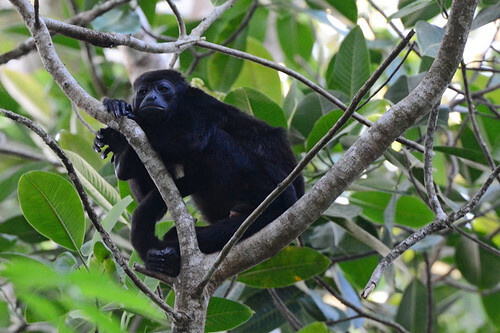 Irene, Saul, and their guide, Bob Behrstock, had found the group of six Groove-billed Anis right there, a half-minute walk from the entrance. 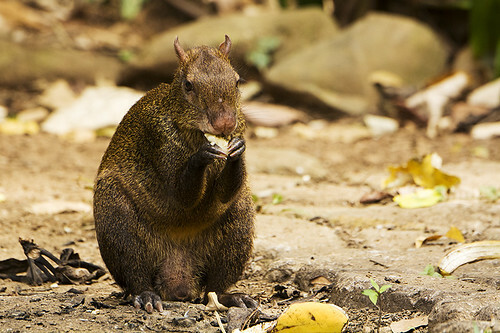 They were happily feeding in a group of large bushes, or small trees, sometimes totally disappearing in the foliage. Rose-throated Becards had nested earlier in the season across from the famous Patagonia rest stop, and the word was that the birds were still there, though the nest had either been abandoned or disturbed, I don’t remember which. I do remember that the nest was behind a fence, and that there was a lot of discussion about the fence, and that one of the experienced birders on the trip really really wanted to see the Becard. My first encounter with a dedicated lister! So, we spent a lot of time at this spot during the week. At one point, I saw leaves move. I thought I saw a bit of a bird. I was so excited! 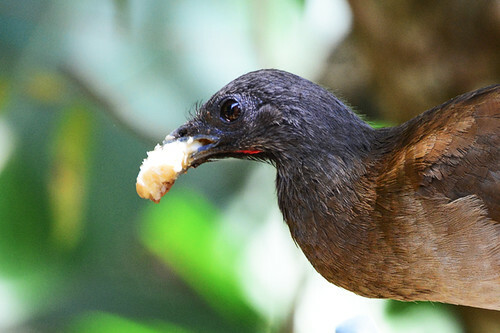 For years I had Rose-throated Becard on my life list till common sense prevailed and I took it off till I could put it back on again after seeing, really seeing, the bird in Costa Rica. But, even now, I hear Rose-throated Becard and I get all trembly and excited inside, connecting back to that feeling of new discovery and listing mania in Arizona. So, when Saul Grysman flagged me down as I was leaving Santa Ana NWR and told me that he and Bob Behrstock had just seen a Rose-throated Becard in the parking lot, about 36 feet from where I had been sitting in my car, I did an inner squee and jumped out. The Becard had flown almost immediately from this first sighting. I searched and left and returned. It was in the picnic area. It might have returned to the parking lot. I talked to local birders about previous Becards at Santa Ana. 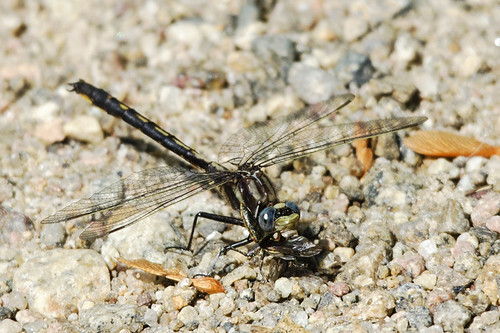 We were in the middle of observing a Common Green Darner eating a Black Saddlebags (or vice versa, it was really hard to tell), when word came that an enterprising birder had re-re-located it on the tiny dead-end path off the picnic area. I ran. I got into the required position to see the Becard, ensconced high up in a tree at the end of the dead-end path. I cooed and squeed and my heart leaped up and down. 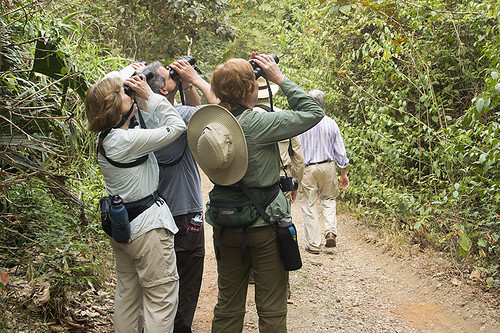 The birders waiting in line to stand in the required position were patient, but I could sense eyebrows being raised. So, I quickly took the above photo and gave up my spot. My trip to Texas was complete. I needed to retire to attend the Rio Grande Valley Birding Festival. It takes place in November, which in the academic world is the busy season, the time when students are researching papers and taking mid-terms. The first thing I did when I retired this summer was look up the dates of the RGVBF. And, then the June date when registration opens. Which was a good thing, because I wasn’t able to get to a computer till three hours after the opening bell, and several field trips were already maxed out! I always love the first day I bird a new place, and was very happy I had arrived a day before the festival started so I could get the feel of the lower Rio Grande Valley at my own pace. I decided to start with a visit to Frontera Audubon, located in Weslaco, where a Golden-crowned Warbler had been seen a few days earlier. 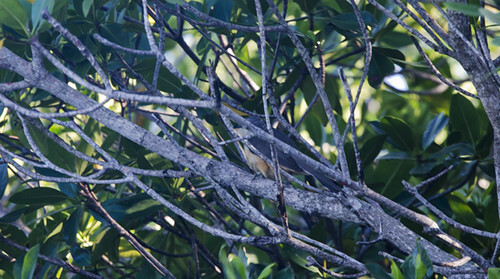 Golden-crowned Warblers are usually seen in Central and South America and I have seen this bird in Costa Rica. But, not the United States! So, this would be a nice addition to my ABA list. The bird was not seen that Tuesday, despite the efforts of many birders, and although I was disappointed, I was too busy taking in all the other wonderful wildlife there to not be wonderfully happy. Butterflies were everywhere! Clouds of Queens and Phaon Crescents and Common Mestras. 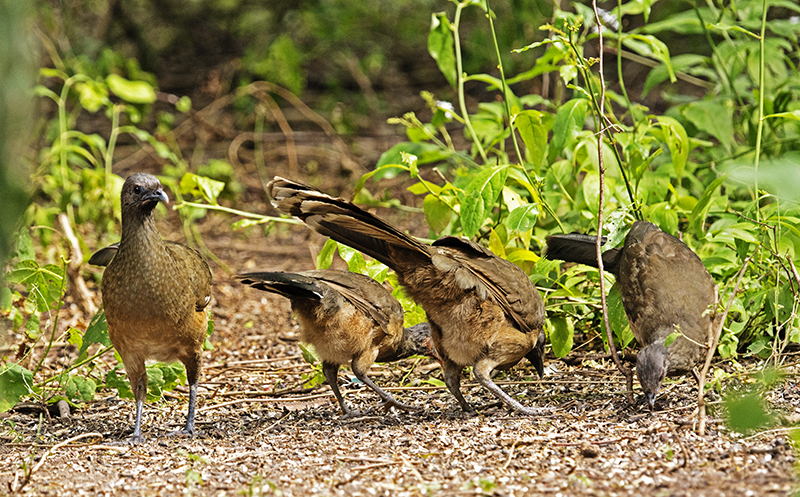 I got my first Texas life bird immediately in the parking lot: Plain Chachalaca! 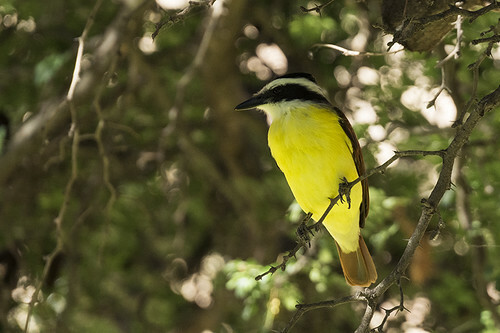 On the Thicket Trail, I heard and then saw Great Kiskadee, an ABA bird. And then, sitting by the creek near the Visitor’s Center, I saw my 600th ABA bird, Baeolophus atricristatus, Black-crested Titmouse! I would see many Black-crested Titmice during the next few days, but none as special as this small, feisty but camera-shy bird. I know it’s just listing, and listing is not the same as really knowing about the bird and its behavior and taxonomy and all the other things we should know about a bird as birders, but I was very excited about this milestone. And, even better, when I put the news on Facebook, my friends were excited with me! It’s always nice to know that you’re not totally crazy. Or, that there are other crazy people who value the same crazy things you do. This damselfly is a Kiowa Dancer, another Life Ode. 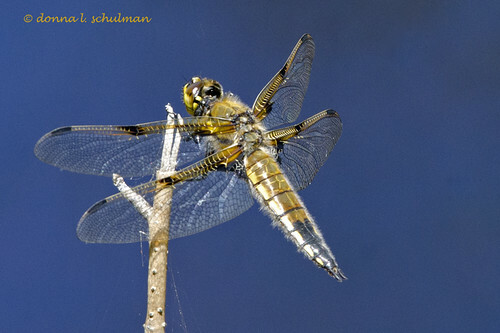 The key to identification is the short-long short-long patterning on the abdomen. I took one more walk down the Thicket path on a final fruitless search for the Golden-crowned Warbler. Fewer birds were in sight and the wonderful, promising bird sound had quieted. 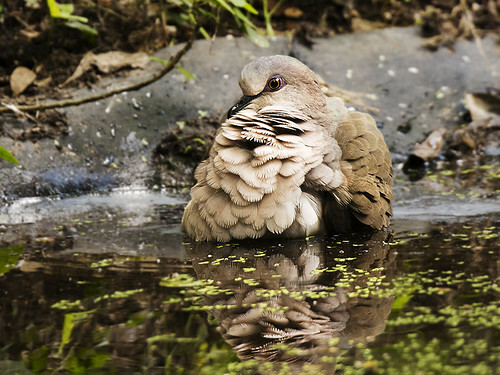 I did see a White-tipped Dove bathing, another ABA bird. Two small Inca Doves were nestled nearby and scurried into the underbrush as I pointed my camera at them. It was time to bird another new place. 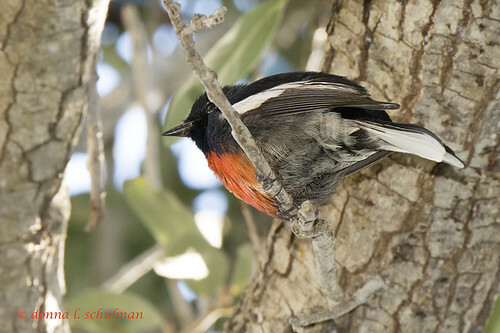 Since I had missed out on the Golden-crowned Warbler, I headed for the University of Texas, PanAm campus, about 20 minutes away, where a Painted Redstart had been seen. 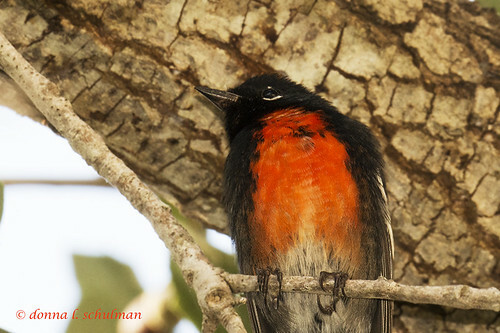 Another neotropical warbler, I hadn’t seen a Painted Redstart since my trip to Arizona at the beginning of my birding “career”. The campus was not far away, but it took me almost two hours to realize that the courtyard where I was looking for the warbler was the Wrong Place. Really, how many courtyards “north of the Science Building” could there be? At least two. I walked around the RIGHT courtyard a bit frantically. I was parked at a meter in the campus parking lot, and time was running out. Time was out. I took one last look at the tree next to me. “Oh! There you are, oh lovely tiny little bird. Thank you for showing yourself. I have one minute in which to take your photo.” Good thing I did, because after I ran back to the meter, put in more money and returned, the courtyard full of students doing a botony project, no warbler in sight. Birding is all in the timing. 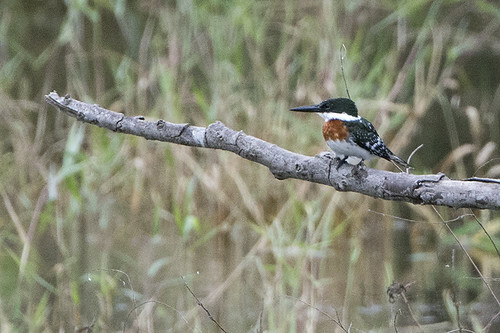 Of course, the Bird of the Rio Grande Valley Birding Festival was the Amazon Kingfisher, found by Jeff Bouton on November 9th, off of Route 100, near San Benito. Second record of this bird in the United State (assuming it will be approved by the records committee, which seems likely). News of the Big Find trickled in to my field trip at the Santa Ana NWR, about an hour’s drive away, making me very anxious and fidgity. Seeing this lovely Ringed Kingfisher did not alleviate the Amazon Kingfisher heebie jeebies. The field trip returned at noon, but my first foray out to TX-100 came up dry, the bird had disappeared. And, I needed to return to Harlingen for my photo workshop. At this point, it felt like every birder and random person at the festival had seen it but me! 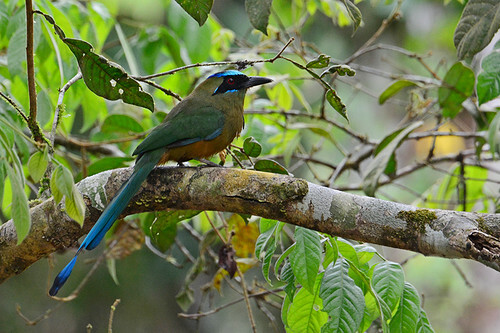 And, let me add that this would not be a life bird, I had seen Amazon Kingfisher in Ecuador. I wanted to be a part of the excitement, cheering and laughing and slapping hands. 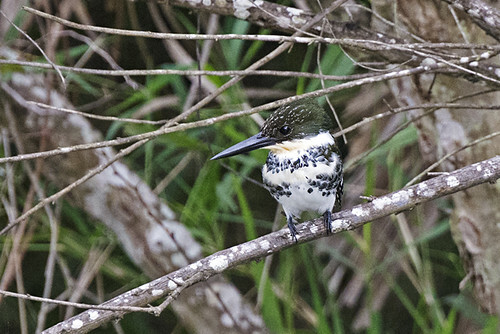 The Amazon Kingfisher was a good ways down the resca when I first saw it. We had fun watching it fly out for a snack and returning to the north side of the resca, perching on various snags, sometimes a little out of sight, but always flying back out into view. Finally, as the light was beginning to fade, the bird flew right towards us and perched for a nanosecond on this snag right in front of me. I got off one photo before it flew back a bit and then over our heads! About a hundred birders crossed TX-100, the police stopping traffic. 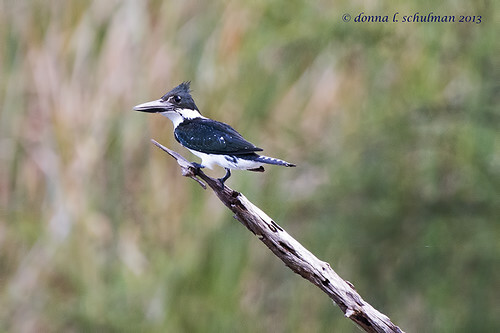 The kingfisher eventually settled himself in a spot only visible from a small area on the edge of the road, and us birders watched happily as new birders, including a guy named David Sibley, approached and viewed the bird from the two scopes placed in that spot. This is part of the fun of a twitch. Sharing the wealth, bestowing the viewing. 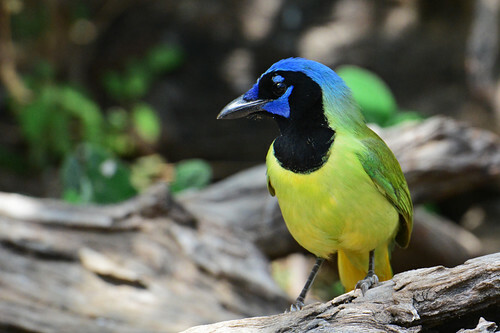 I loved birding and observing nature in the Rio Grande Valley. The Rio Grande Valley Birding Festival was the perfect way in which to get my first taste of Texas. Great birds, great butterflies, great people. I will be writing more about my adventures in Texas soon. We didn’t originally plan to visit Santa Cruz Island. We–my friend Ian and I– decided that it would not work out. Our time in Southern California being limited, we wanted to squeeze as many life and Western birds out of each day as was possible, and with the boat leaving Ventura Harbor at 9am and not returning till dusk, it seemed to us that this would mean spending an awful lot of time on an island with limited birding opportunities. Of course, there was the almost certain opportunity of seeing the island’s bird star, the endemic Island Scrub Jay, Aphelocoma insularis . But, this one Life Bird seemed small potatoes compared to a pelagic trip, an all-day birding trip at sea, promising oodles of sea birds we would never see on land. Fate being what it is, the pelagic trip out of Santa Barbara was cancelled due to lack of participation (hey, Santa Barbara birders! what’s the deal with that? 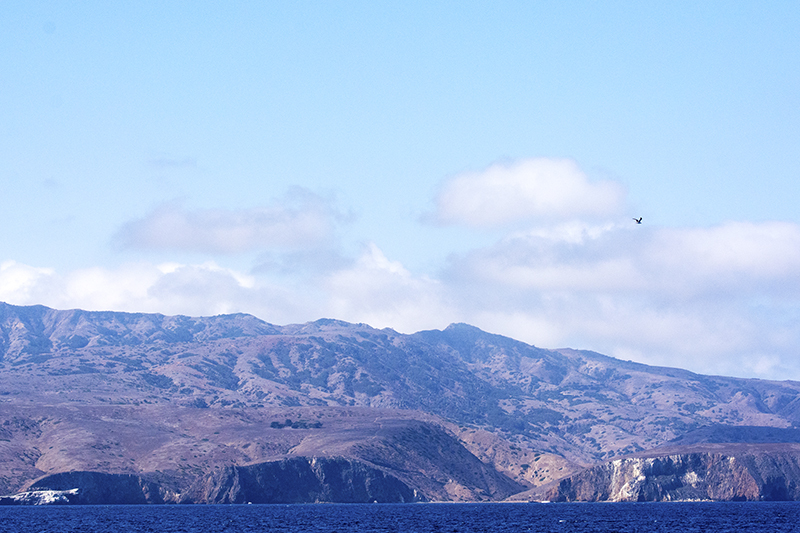 ), and luckily I was able to get tickets on the Island Packers boat to Santa Cruz Island (above) for the same day, Saturday, September 21st, right before they declared the trip full. Yes, apparently people would rather be on a 1.5-hour boat ride to a pretty island where they can hike and picnic than on a 9-hour boat ride where they might see jaegers and shearwaters and….might not. 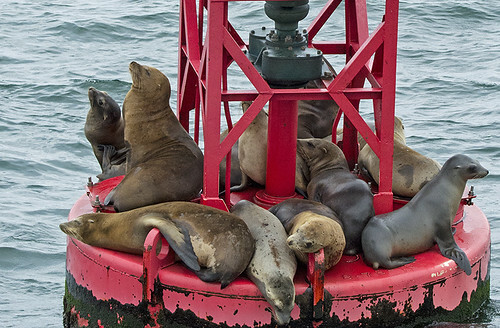 The fun started on the way out of Ventura Harbor, passing these Sea Lions on one channel marker, and, very quickly, the resident rarity, a Brown Booby (Sula leucogaster), on channel marker 3. The photo below was taken a week later, from Marina Park. 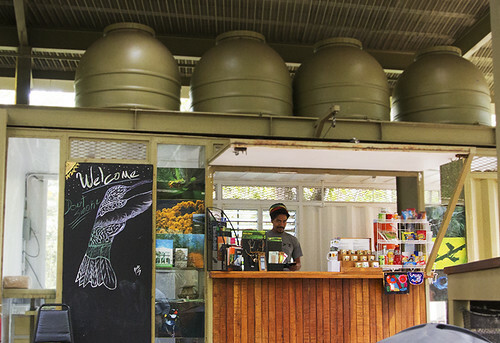 The Brown Booby is the bird on the right. 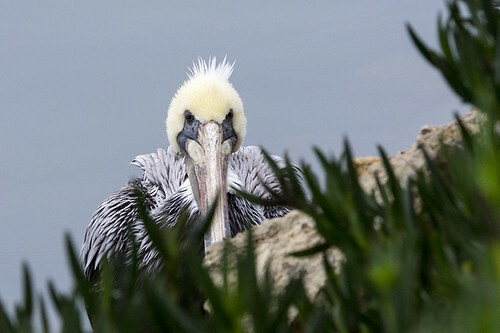 Apparently, Blue-footed Boobies were also being seen on the Ventura Harbor breakwater, but we didn’t see them that day. We did see many Blue-footed Boobies at other locations on our trip. Island Packers boats sail to Santa Cruz Island daily May through September (and, it looks like,from their web page, October too). I was surprised that the boat ride was 1.5 to 2 hours long, but the time goes quickly. Unless you’re like me and get slightly seasick even if you’ve taken anti-seasickness medicine. Ian and I were entertained by a pod of dolphins and periodically tried to identify seabirds and gulls. 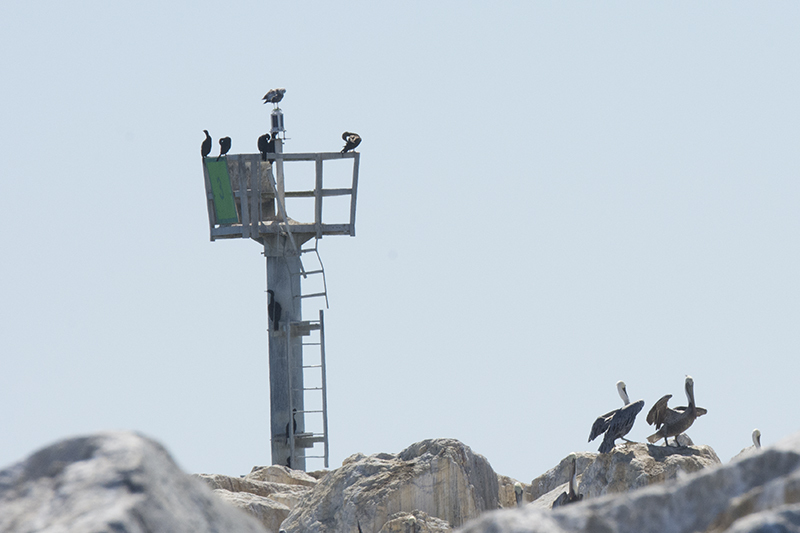 At one point, we were surrounded by acrobatic Black-vented Shearwaters, a life bird for Ian. Other people who have taken this boat ride have seen whales and Pink-footed Shearwaters (what I was hoping for). But, the goal of the boat is to reach the island, so there is little time for pausing to identify and observe sea life. Here’s a map of the island, from the Island Packers web site. They, in turn, seem to have borrowed it from the U.S. National Park Service. 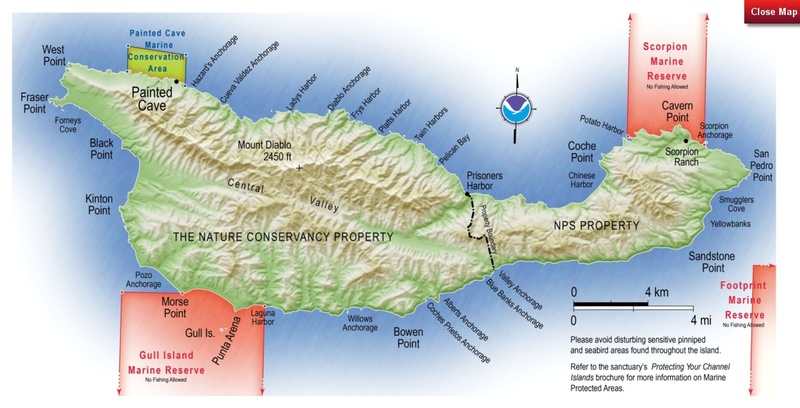 Santa Cruz Island is owned by the U.S. National Park Service (24%) and a group of nonprofits–The Nature Conservancy, the University of California Field Station, and the Santa Cruz Island Foundation (76%). It has a complicated history, which is nicely encapsulated by Wikipedia (and maybe by the National Park Service, but I cannot access that website today, while the U.S. government shutdown is in progress, though why the website must be shut down is a mystery to me). 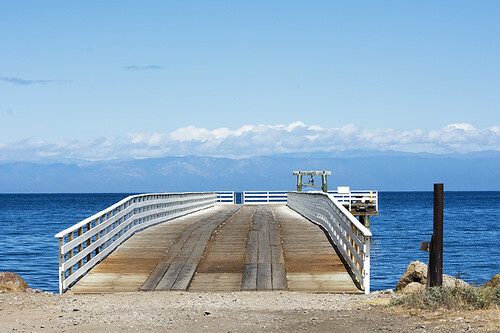 The island was originally populated by the Chumash Indian tribe, and then taken over by Mexico, which briefly used it as a home for convicted criminals (thus “Prisoners Harbor”), and then granted to a Mexican army captain. There was then a series of owners and litigation over ownership worthy of a mini-series or a big fat book, like the kind Michener used to write. More importantly, the island was home to a thriving sheep ranch and then a cattle ranch. It was also used for hunting, fishing, smuggling, and military operations. By the time the majority of island land was sold to the Nature Conservancy, introduced species like sheep and feral pigs, and invasive species like the Golden Eagle were destroying native island ecology. 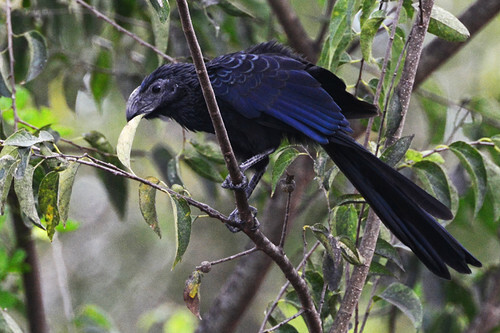 Endemic species, notably the Island Scrub-Jay and Island Fox, were in danger of extinction. The Nature Conservancy to the rescue! Seriously, they (and I assume the U.S. Park Service, though I can’t research that part of it with their website down!) have done an incredible job here, removing the sheep and pigs, relocating the Golden Eagles and re-introducing the Bald Eagle, replanting bare hillsides with native plants, and more. 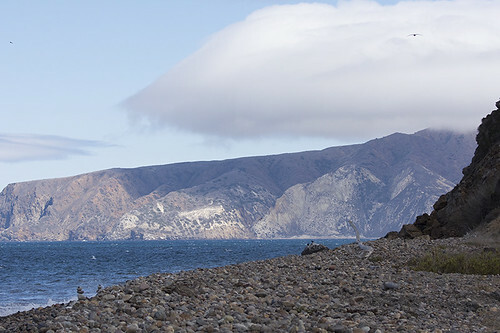 There are two places to land on Santa Cruz Island. 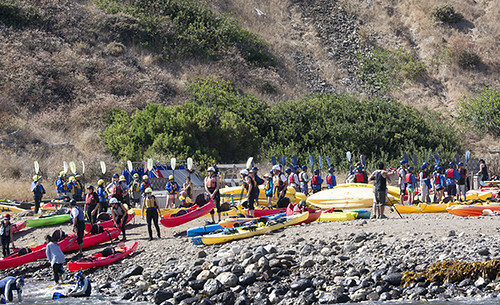 If you’re a boy scout or a kayaker or an athletic young person, then you probably want to get off at Scorpion Anchorage, where you can kayak and hike and camp and play the guitar. If you’re a birder or a Nature Conservancy person, then you probably want to disembark at Prisoner’s Harbor, because that is where the Island Scrub Jay hangs out. 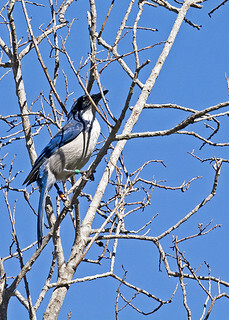 Scrub-Jays are members of the Corvid family, and they were considered one species till 1998, when they were split by the AOU into three species–Western Scrub-Jay, Island Scrub-Jay, and Florida Scrub-Jay. The Island Scrub-Jay looks very much like the Western Scrub-Jay (which itself is a candidate for being split into coastal and inland species), only it is darker and larger, with a heavier bill. The bird is on the Yellow list of the American Bird Conservancy, which means that it is in need of conservation attention, but not to as great a degree as those species on the Red list. 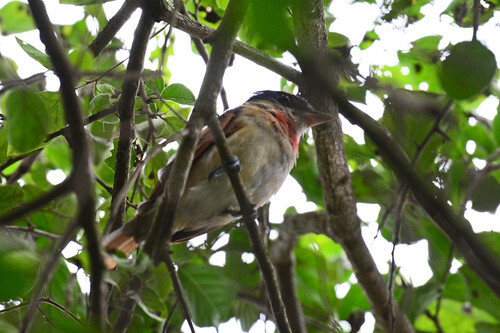 However, Birdlife International has uplisted the species to the Vulnerable list because (1) it exists only on this island and can be wiped out by a catastrophe, like a super-storm, and (2) it’s vulnerable to West Nile disease. Also, while it had been estimated that there were 9,000 scrub-jays on the island, more recent counts indicate there are far fewer–less than 3,000 individuals and less than 1,000 breeding pairs. The Nature Conservancy is on the case, and has a program to vaccinate the birds. It involves peanuts on a stick, a box, and a vaccine. 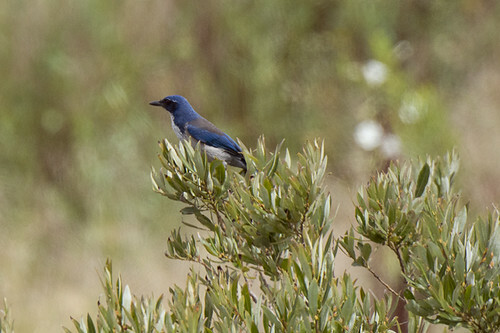 Ian and I were, of course, most anxious to see the Island Scrub-Jay, and it didn’t take long before we heard it. Another few minutes later we saw the bird! And then another. And then another. The birds had a maddening habit of appearing just beyond the distance needed for good photographs or in the middle of a tree or vocalizing very near us and then flying away before we could aim our cameras. Still, we were very happy to see so many Island Scrub-Jays; both for conservation reasons and because they were Life Birds! 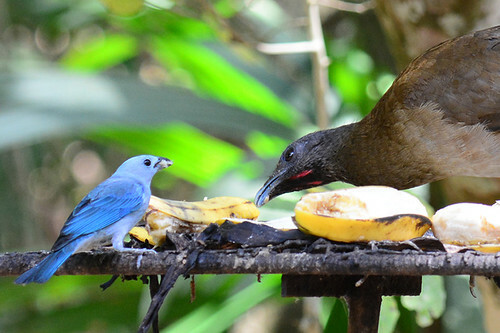 I wondered whether, like their cousin, the Florida Scrub-Jay, they could be coaxed closer with peanuts. Alas, I had no peanuts with me, for a reason only Ian knows, and probably would not have tried this even if I did, out of respect for the rules of the organizations that own the island. The other endemic creature living on Santa Cruz Island is the Island Fox, a small creature the size of a small house cat (so they say, Ian and I think it’s a pretty large cat). In fact, “there are six subspecies of the island fox, each of which is native to a specific Channel Island, and which evolved there independently of the others” (thank you Wikipedia). The Island Fox population had fallen to less than 100, mostly due to the arrival of the Golden Eagle, when the Nature Conservancy and its partners started its Island Fox Recovery Program in 2002. 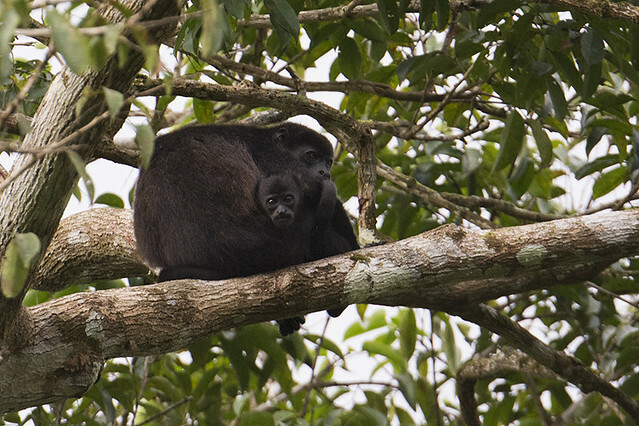 The program included captive breeding, close monitoring in the wild, and vaccination, and has been so successful that the captive breeding program could be discontinued. 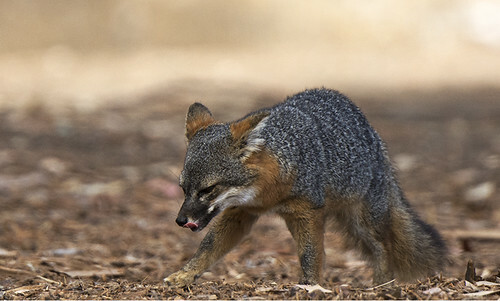 There are now more than 1,300 Island Foxes on the island. 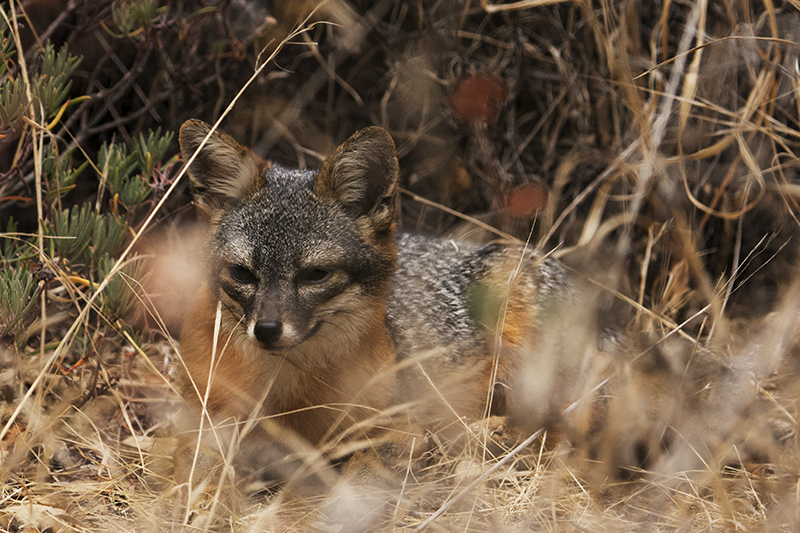 We spotted our first Island Fox down the hill, right after our first Island Scrub-Jays flew away. And, then, like the scrub-jay, we saw another! And another! We were so excited, we ran after them (at a distance) and took photograph after photograph. Let me tell you, it was really hard not to go up to this totally adorable and almost cooperative fox and remove those grasses by its face. 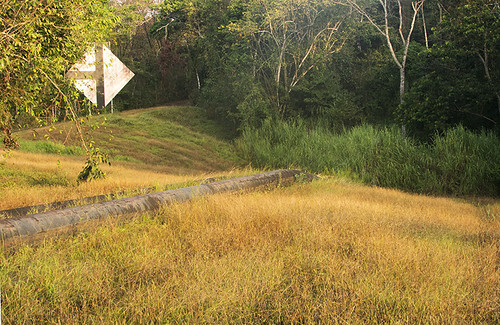 Later, we found the Island Fox pictured at the beginning of this post, hunting the picnic area. The Park Service provides fox-proof bins where visitors can store their lunches, and they are definitely needed. Every fox has the most trusting expression on its face, doesn’t it? Even when it’s scrounging under a Park Service jeep or trying to open a large cooler on a picnic table. A pair of Common Ravens also frequented the picnic area, first calling to one another, and then coming down to seek out goodies. I wished they had stayed up in the trees. Seeing these majestic birds poke around like, well, crows, really took something away from their mythic stature. It turned out that the island was very birdy, that you didn’t need to hike very far to see birds (we had decided not to go on the 4.3 Nature Conservancy hike), and, as one of the naturalists on the boat told me, anything could show up. This Clay-colored Sparrow was a very good find, both for the island and California. 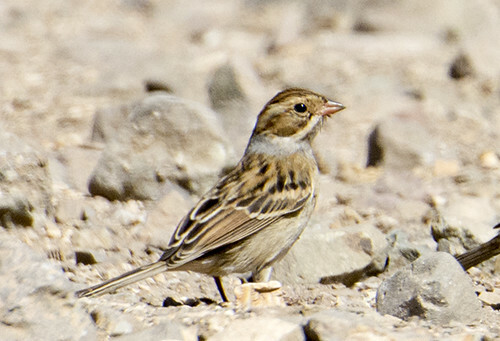 It was foraging on a dusty path with a stripey western Savannah Sparrow and a western Chipping Sparrow (I found that many of familiar sparrows looked very different in California). Finally, at 4pm, it was time to board the boat for the trip home. The boat was delayed by about 20 minutes, which gave us an opportunity to sit by and dock and simply enjoy the beautiful view. A trip to Santa Cruz Island is not a pelagic, but it does offer up its own unique wonders. The Adirondacks is more than birds. It’s also dragonflies and butterflies. I was very excited to see some “life” leps and odes (my terms for Lepidoptera and Odonata) on my NJ Audubon trip to the Daks. 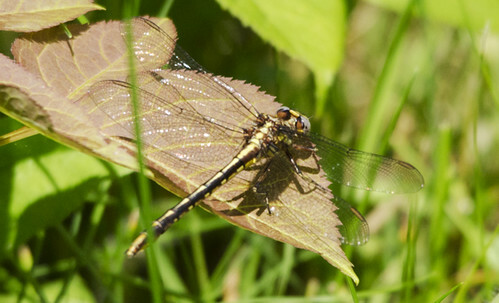 The first odonate we saw were Ebony Jewelwings, Calopteryx maculata,flying in the shady areas of a little bridge in Bloomingdale Bog. Not a life damselfly for me (they are fairly common in New Jersey, just look in your nearest drain ditch! 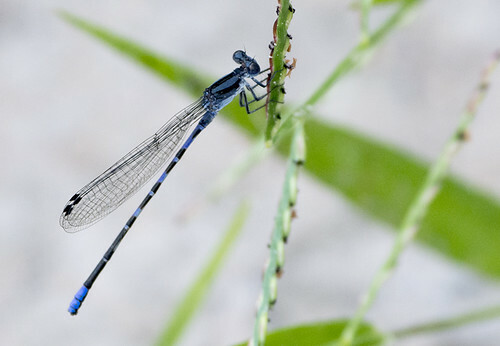 ), but this beautiful damselfly was a lifer for many people in our group. This isn’t the best photo I’ve ever taken of Ebony Jewelwing, but it gives you an idea how lovely it is. I spotted this Four-spotted Skimmer, Libellula quadrimaculata, on the second day of the trip. We had stopped on the road in search of American Bittern, and, as is my wont, I wandered from the group and found several interesting odes by a brook. This wasn’t the first time I spotted Four-spotted Skimmer (or Four-spotted Chaser, as it’s known in Europe) during the weekend, but it was definitely the most cooperative, perching in front of a blue background and allowing a sliver view of its face. 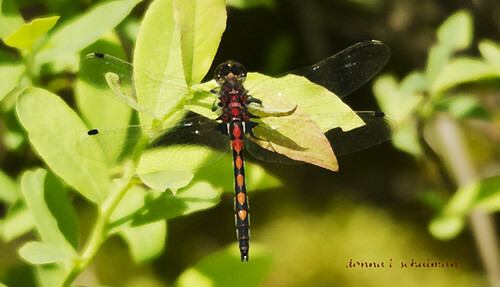 Another dragonfly I spotted here was the Crimson-ringed Whiteface shown below. Just goes to show what you can find on a random stop by the road! 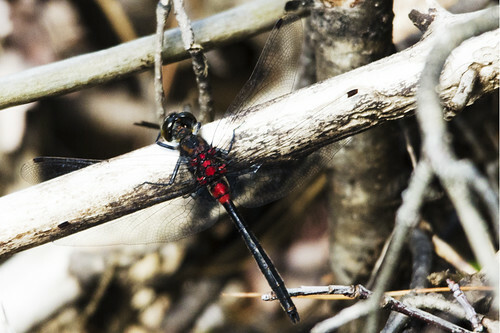 Chalk-fronted Corporal, Ladona julia, was the most common dragonfly we saw, especially around Paul Smith’s College Visitor’s Interpretive Center. (That’s the lake in back of the VIC above.) They tend to inhabit acidic lakes and marshes and beaver ponds. Are beaver ponds acidic? I guess so. 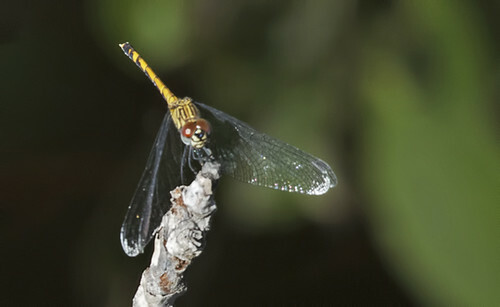 Frosted Whiteface, female, Leucorrhinia frigida. 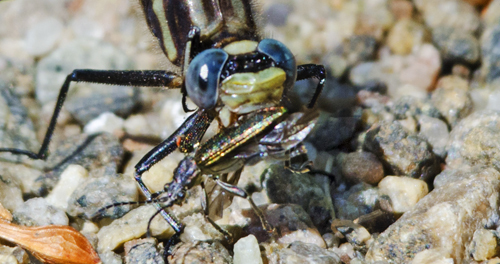 Dragonflies are predators. Beautiful predators. Fred, a member of our group, pointed out this dragonfly to me Saturday afternoon, on the trail of Bloomingdale Bog south. I’m not sure what this Dusky Clubtail, Gomphus spicatus, is eating. Some kind of beetle? He was enjoying it so much, I think I could have picked him up and he still would have been chomp-a-chomp. 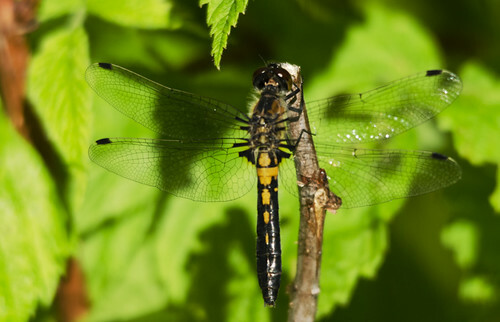 This is Lancet Clubtail, Gomphus exilis, the distinguishing detail being the pale tip. Most of the clubtails I see anywhere have slender clubs. 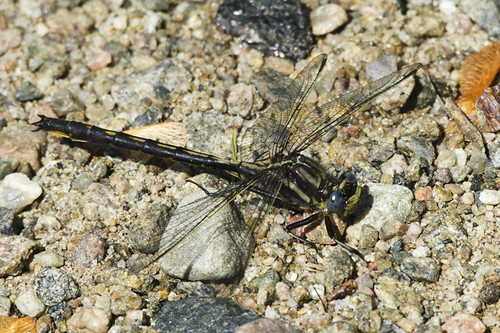 For once, I would like to see something like Skillet Clubtail, you know, a dragonfly with one BIG fat club. Still waiting on the definite word of this dragonfly. 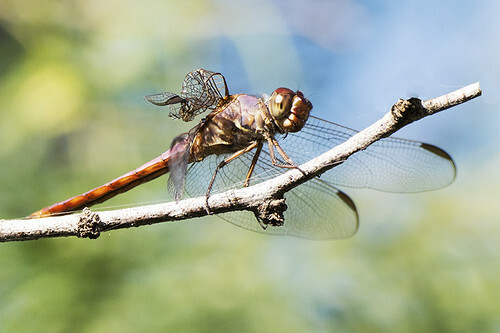 I’m guessing Beaverpond Baskettail, but feel an urge to just label it Ol’ Google-eyes….Oh wait! Breaking news! 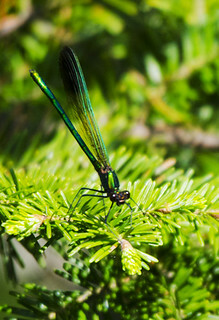 This is a Racket-tailed Emerald, Dorocordulia libera! Just got confirmation from three experts on FB Northeast Odonata, including Ed! I thought is was a baskettail because of the yellow spots on the abdomen, but the consensus is that the spots are a reflection. “Emeralds are shiny,” to quote one of my experts. 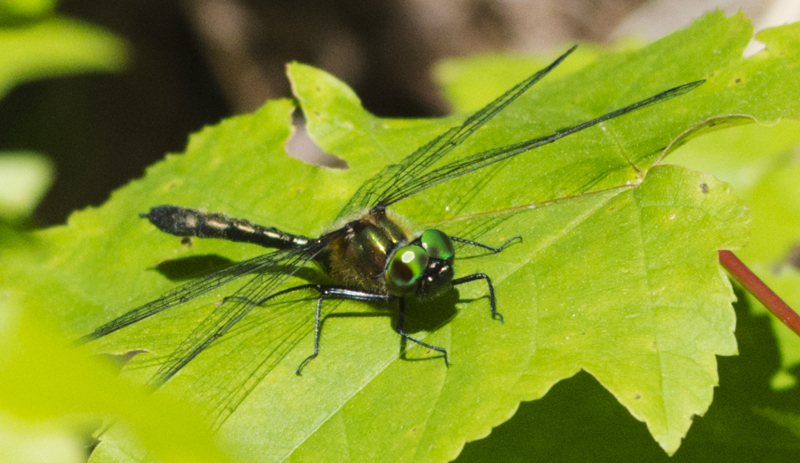 I am a very happy dragonfly-lover right now, because Racket-tail Emerald was on my list of odes I wanted to see before I die. I know, I know, where are the butterflies? 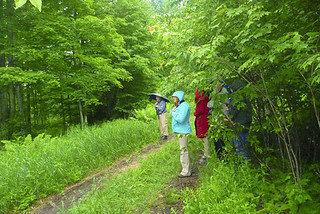 We didn’t see as many as I expected, and I don’t know if that is how the Adirondacks is at mid-June or if it is part of the scarcity of butterflies I had been observing in New Jersey and New York. We did see many Canadian Tiger Swallowtails, Papilio canadensis. 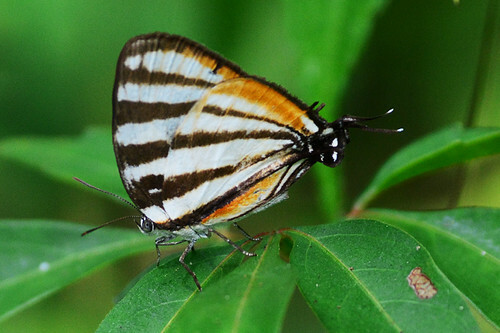 Just like Eastern Tiger Swallowtail, but smaller. 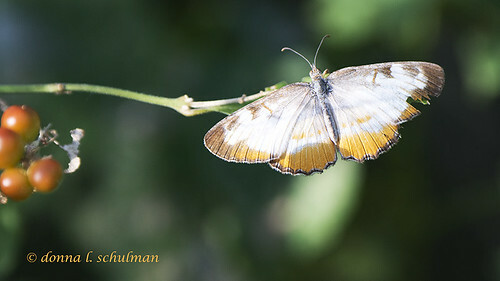 A life butterfly for me. 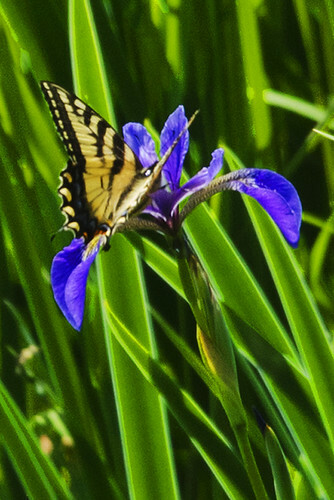 I think the flower is Blue Flag Iris, a wildflower that grows in Heron Marsh, behind the Paul Smith’s College VIC, where this photo was taken. And, another lifer, Arctic Skipper, Carterocephalus palaemon. 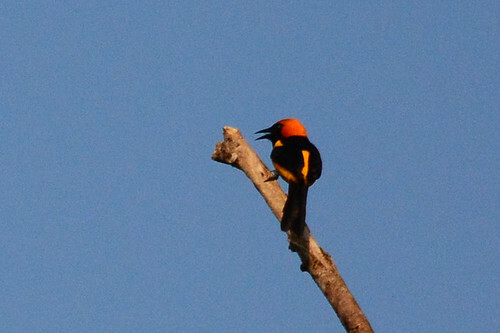 I saw several in Bloomingdale Bog, which made me almost as happy as viewing the Black-backed Woodpecker. 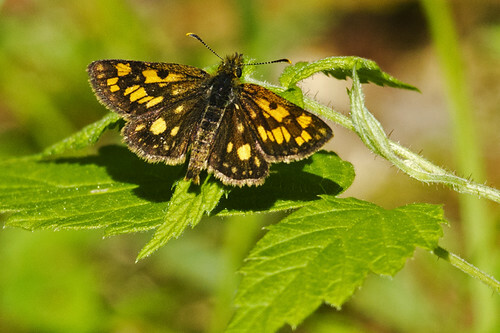 Arctic Skippers are small, 29-32 mm, which is an inch and a smidge. 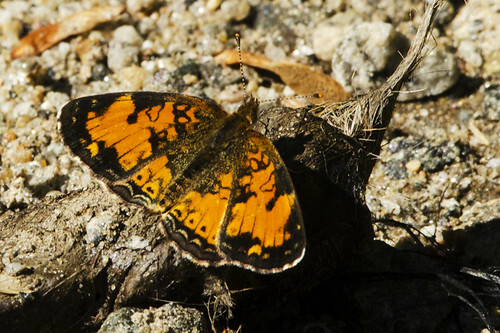 Northern Crescent, Phyciodes cocyta, was not a life butterfly, but it was only the second time I’ve seen one. A cousin of the Pearl Crescent seen everywhere in New Jersey fields. It feeds on asters, so I’m not sure what it was doing here. And, here is a non-bird surprise that was one of the favorites of the group, a female Snapping Turtle, Chelydra serpentina, laying eggs. We saw mama Snapper on Sunday, a rainy cloudy day. 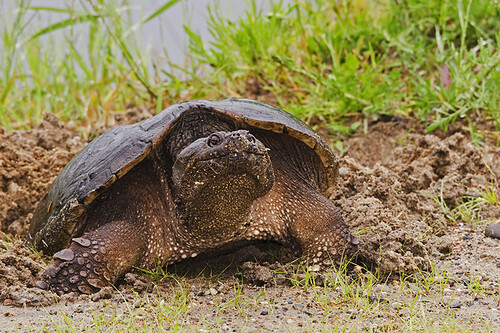 I am not a Snapping Turtle fan (once you’ve seen one pull a Wood Duck to its sad death, it’s hard to root for them), but I have a lot of respect for moms who don’t let anything, including the weather, stop them from doing their generational duty. 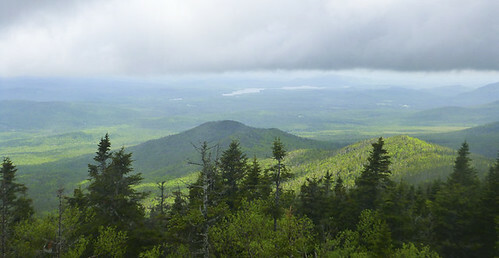 The biodiversity that makes up the Adirondack bogs and forests is limited. This is not an environment where a wide variety of creatures can live. But, as I said in Part One. the birds, dragonflies, butterflies, plants, trees, and, yes, even the snapping turtles that live there are wonderful and unique. I am so happy New Jersey Audubon offers this trip every June. Scott Barnes and Linda Mack are fun, knowledgable leaders, and the rest of the group, who ran the gamut from very experienced to novice birders, were great company. So, next June, get thee to the Adirondacks! Black flies possible, but not probable. – I had heard fun stories about the trip from my friend Laura, Somewhere in New Jersey. The stories usually involved black flies, lots of black flies, but I figured that if Laura was covered with biting bugs and still had a good time, then this must be one hell of a trip. 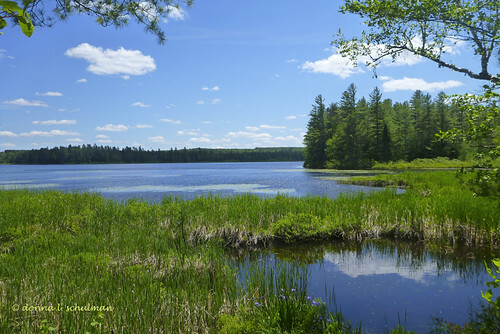 We zipped up north to the Saranac Lake, Franklin County area on a Friday and headed immediately for Bloomingdale Bog. 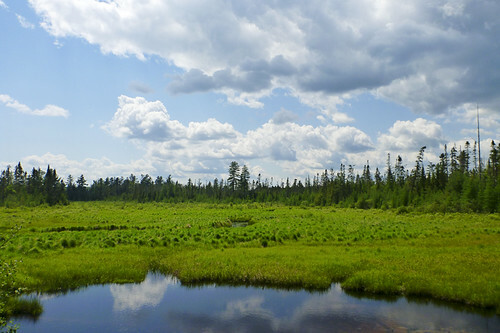 Boreal bogs are the cornerstone of Adirondack birding, nutrient-poor wetlands that accumulate acidic peat, a deposit of dead plant material. 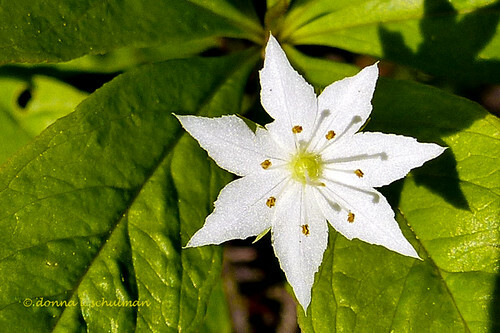 Because of the lack of nutrients, the number of plants and creatures that grow in boreal bogs is limited, but those that do are very special, living things that can live in harsh conditions and often no place else. Places like Bloomingdale Bog take hundreds of years to form, and are too easily destroyed. So, I was happy to be in this special place. We walked down Bigelow Road, a dirt road at the northern end of the bog. (I’m a bit confused about the relationship between Bloomingdale Bog and Bigelow Road. They seem to be the same but separate places.) And walked. And walked. It was late afternoon and not very birdy. 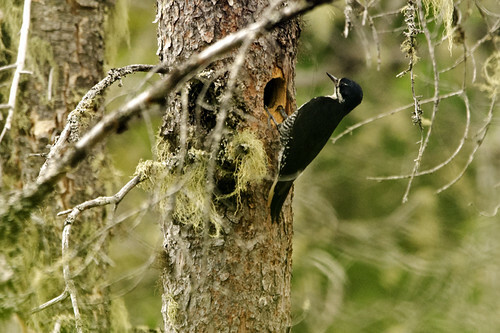 But, there seemed to be a purpose to our walk, and finally Scott told us that he had been told about a Black-backed Woodpecker nest in the area. Right past the big puddle. Oh. Since Scott had gotten these directions a week ago, there was much discussion about whether the puddle would still be there, and what constituted a big puddle. But, soon the well-eared amongst us (not me!) heard the sound of young woodpeckers, and there was a Black-backed Woodpecker feeding young at a fairly large hole in a tree near the road. I was lucky, I got a good look before the bird flew away. But not everybody did, the greenery blocked a straight-on view for many in the group. So we waited, and soon the mama woodpecker was flying in. We couldn’t see the baby birds, deep in the nest hole, but we could certainly hear them chittering away in joy as mama arrived. And, a few feet down the road we found an excellent viewing site where somebody had clipped the greenery down to eye level. Aha! A much better marker than a puddle (which actually was still there). And, everybody got to see these beautiful, striking woodpeckers. Life bird for some, a good bird for all. An excellent start to the weekend! 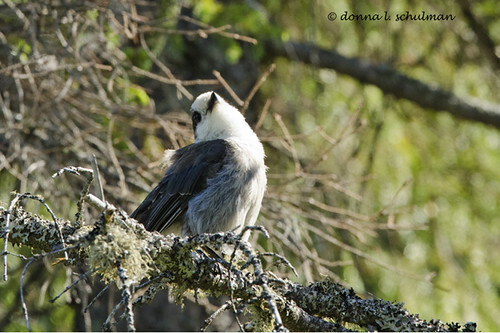 On the way back, we encountered our second boreal species, Gray Jay! 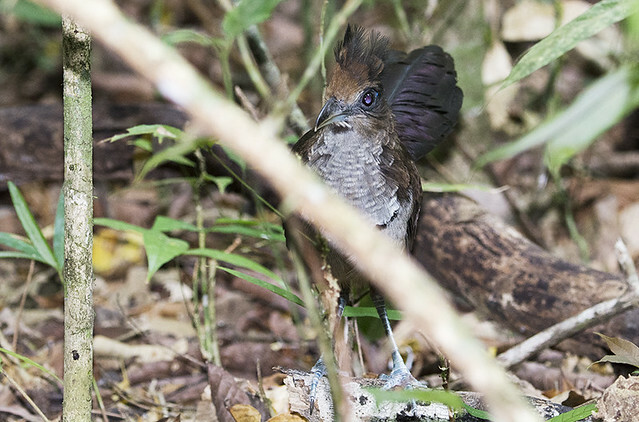 These birds are irresistible–gregarious, curious, and totally adorable looking. An interesting change from the imposing Blue Jays I’m used to. I had first seen Gray Jays out in Colorado, where we would throw them chips and then try to photograph them as they ate the chips and flew away. These jays were no different. When we encountered them again the next day, Cathy volunteered to share her peanuts with the jays, and she quickly became the most popular birder in the bog! 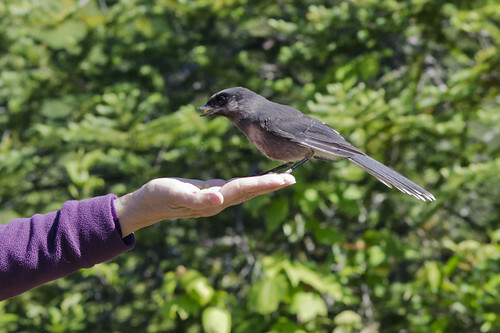 It wasn’t always easy to photograph the Gray Jays, they moved very quickly to and from Cathy’s hand, flying to the top of a tall spruce when the peanuts ran out. But, they were a lot closer than many of the other boreal species we saw that weekend. Yellow-belled, Least, and Alder Flycatchers and Lincoln’s Sparrow were all seen best through the scope. I was extremely happy that the other boreal species we saw naked-eye in your face close was Mourning Warbler, Geothlypis philadelphia. 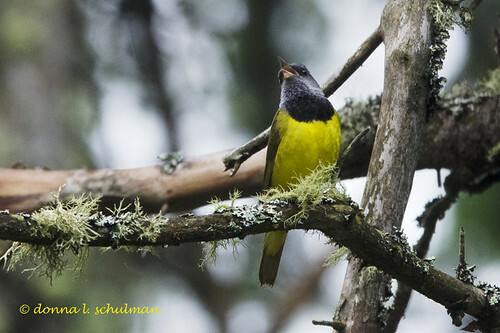 We encountered this songbird on a rainy Sunday, first on a roadside where only a few of us saw it well, and then, wonder of wonders, at the Azure Mountain trailhead. This handsome, vigorous bird was singing loudly when we got there, and just a hint of its song brought it into our sight immediately. He did not leave the area until we left, though he spent most of his time in the brush and leaves, as they are wont to do. This was definitely my favorite bird of the trip. 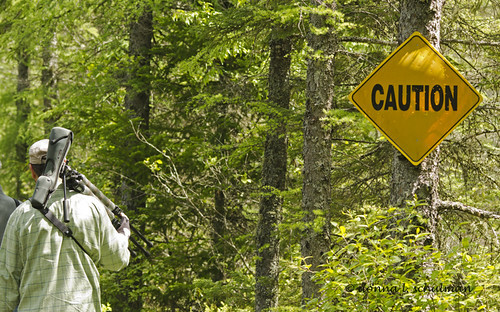 There are many natural wonders to enjoy in the Adirondacks in addition to birds. I am clueless when it comes to the striking plant life, so I’m going to quote from the excellent Paul Smith’s College Visitor’s Interpretive Center web page: “This habitat is a nutrient-poor, acidic wetland dominated by sphagnum mosses, sedges, and shrubs and evergreen trees rooted in deep peat. 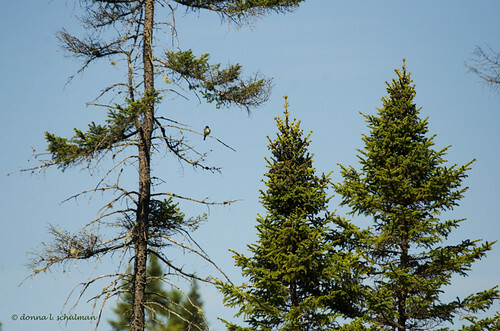 The two main trees found on Barnum Bog are Black Spruce and Tamarack. 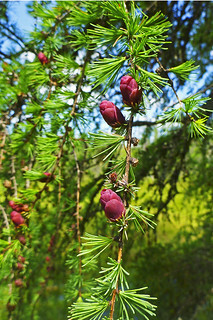 Tamaracks, which are also known as the Eastern Larch or American Larch, are coniferous (cone-bearing) trees which behave like a deciduous tree; the needles of the Tamarack turn a golden yellow in fall and drop to the ground, appearing again in the spring. 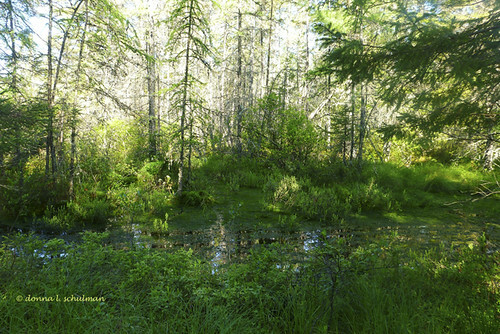 Tamaracks thrive in the acidic environment of bogs.” The photo on the left is a Tamarack, Larix laricina, close-up. Yes! 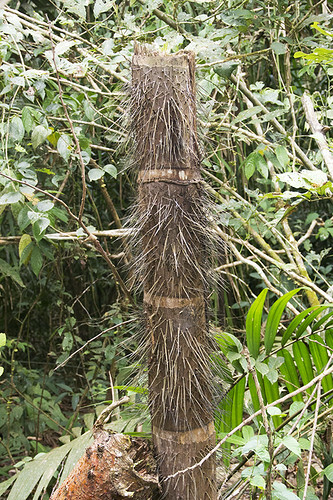 Those are cones, in this case young female cones. The male cones are yellow. 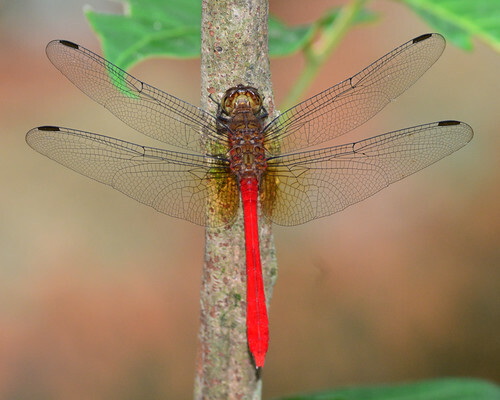 I’m going to write about the dragonflies and butterflies of the Daks, and a surprise non-bird creature, in another blog post, June in the Daks, part 2. 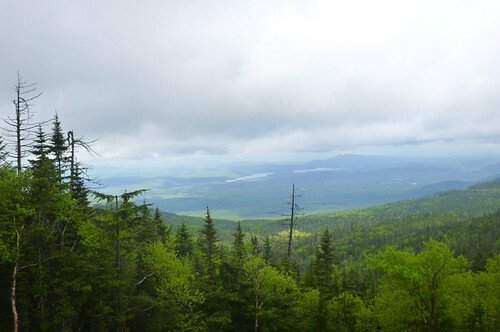 To end this post, here are some photos of the view from the last stop on our trip, Whiteface Mountain. I did not get the life bird view of Bicknell’s Thrush that I was hoping for, but I did hear it. (In a way I’m happy I didn’t get the bird, because that means I still have a life bird in New York State to look forward to.) 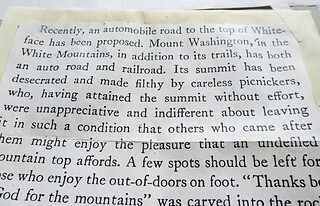 I also got an interesting lesson in attitudes towards the environment in 1929, when the building of the Whiteface Memorial Highway was first proposed. “A few spots should be left for those who enjoy the out-of-doors on foot.” Well, I tend to agree with preserving land, but I’m happy they built that road. Climbing 4,867 feet is not my idea of birding fun. The road enabled us to drive almost to the top, with the remaining 267 feet achieved through an elevator reached through a tunnel into the mountain. Even on a cloudy day, the views were a wonderful reminder of the beauty of the Daks.